In this enjoyable biography the author describes her father's experiences in the 1920s, 30s and 40s, growing up in poverty in the Potteries town of Stoke-on-Trent during the First World War, joining the Royal Navy as a teenager in the 1920s and serving on a variety of ships before and during the Second World War. Joe's recollections of the Potteries in the early 20th Century are now of considerable historical interest. He grew up in Hanley and his father was employed by Taylor Tunnicliffe, one of the many potteries active at the time. He joined the Royal Navy in 1926, at the age of 17, and trained at HMS Ganges. In the inter-war years he served on a variety of ships including HMS Comus and HMS Emerald, based at Trincomalee in India. He subsequently trained as a gunner and as a deep-sea diver and would serve in both capacities during the Second World War. Joe’s wartime experiences were remarkable in many ways. 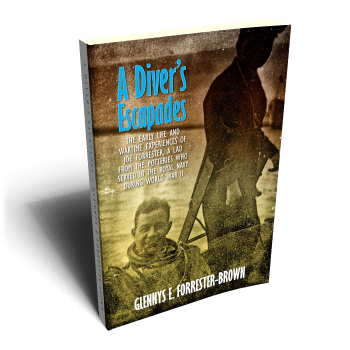 He served in Europe and the Far East as a gunner and a deep-sea diver, seeing more than his fair share of action and being shipwrecked on three occasions. While serving on HMS Curlew in 1940 he survived being sunk in a Norwegian fjord. Subsequently, as a gunner aboard HMS Prince of Wales, he was involved in action against the German battleship Bismarck, in the course of which his ship was badly damaged. He was again aboard Prince of Wales when, having sailed to Far Eastern waters, it was torpedoed and sunk. He and other survivors were picked up and taken to Singapore -- just as it was about to fall to the Japanese. He and a few others made a last-minute escape hidden on a native ship and, after a series of adventures, made it to Ceylon, which remained under British control. Here he was to be involved in salvage work as a diver and crewmember of salvage vessel Salviking for the next two years. He was aboard Salviking when it too was torpedoed and sunk near the Maldives while on its way to assist the badly-damaged HMS Paladin. Once again, Joe was fortunate to survive. 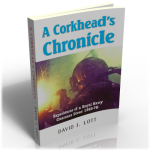 A quiet and modest man, Joe seldom spoke of his wartime exploits and it was not until after his death, over 50 years later, that his daughter discovered a notebook in which he had recorded his remarkable experiences and his recollections provided the raw material for this book.